In the Noord-Hollands Archief, Haarlem, thirty-four completely unknown drawings by Frans Post (1612-1680) have been discovered. The 17th-century artist from Haarlem—who worked in Brazil between 1637 and 1644 in the entourage of Johan Maurits of Nassau-Siegen, governor of the Dutch colony there—is famous for the paintings of Brazilian landscapes that he produced after his return to the Netherlands. That the native flora and fauna depicted in these paintings must have been based on original drawings made in Brazil was always suspected. Until now, however, not a single animal or plant study from his hand was known. 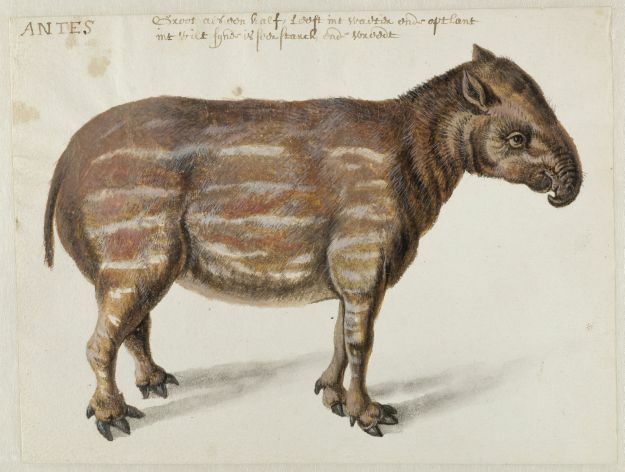 Alexander de Bruin, curator of the image collection of the Noord-Hollands Archief, stumbled, to his utter amazement, upon the unrecognized studies—which include a white-lipped peccary, Brazilian porcupine, nine-banded armadillo, capybara, jaguar, and white-eared opossum—by accident in the course of a digitization project. The story of his sensational discovery will be published in the September issue of the international journal Master Drawings. 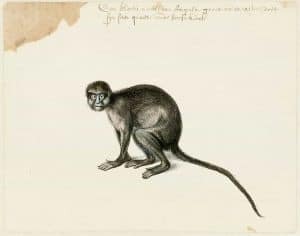 From 7 October, the drawings, together with a selection of related paintings and corresponding stuffed specimens of the South American animals, lent by the Naturalis Biodiversity Center, Leiden, will be on view at the Rijksmuseum, Amsterdam, in the exhibition Frans Post. Animals in Brazil. The discovery was so extraordinary and unexpected that a thorough investigation was needed to establish that the drawings really were by Post. Colleagues from the Noord-Hollands Archief, the scholarly journal Master Drawings, and the Rijksmuseum worked closely together on the research. By comparing the animals in the drawings with similar motifs in the paintings, it became clear that the drawings were indeed autograph studies by Frans Post. The cache includes, for example, both a preparatory sketch and a finished gouache for the capybara in a painting in the Louvre, the only work made in Brazil to feature a prominent native animal. 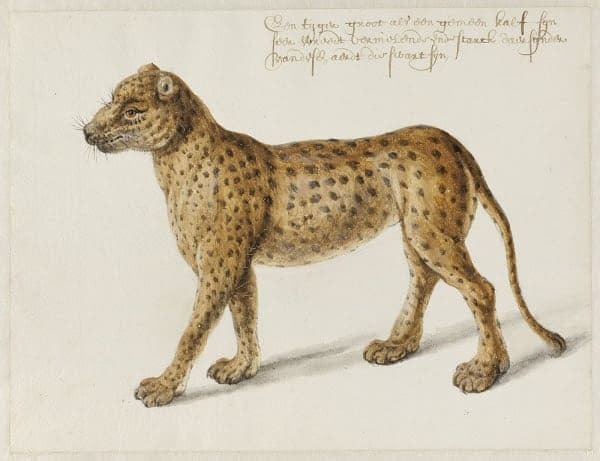 Alexander de Bruin, curator of the image collection of the Noord-Hollands Archief, about his discovery: These drawings with their inscriptions have a immediacy about them that makes you feel as if you were looking over Frans Post’s shoulder, as he recorded the fascinating fauna of the New World. The animal studies provide the missing link between Post’s seven-year Brazilian adventure and the paintings he produced on his return to Haarlem. The Rijksmuseum and Master Drawings instantly recognized the importance of this spectacular discovery and have taken the opportunity to share it with the general public. For that I am sincerely grateful to them. The group consists of twenty-four colored drawings in gouache and watercolor and ten sketches in graphite. Most of the drawings are annotated in a 17th-century hand, the graphite studies by Post himself. Some of the inscriptions are quite amusing: the macaque monkey is described as very friendly and good-natured (“seer vriendelijck ende aerdich”), the jaguar is very ferocious, destructive and strong (“seer wreedt, vernielende ende starck”), and the armadillo tastes like chicken (“smaeckt gelijck een hoen”). Frans Post must have made drawings of Brazilian plants, too, but these were not found in the archive. Shortly after the West India Company was established (1621), the Dutch Republic tried to conquer portions of Brazil from the Portuguese. Brazil was the largest sugar-producing region in the world. Hundreds of sugar plantations operated there using slaves from Angola. Eventually the Dutch defeated the Portuguese in 1630. The arrival of Johan Maurits of Nassau-Siegen in 1637 as the colony’s governor was meant to stabilize the situation and to expand the Dutch territories. Johan Maurits thought big. His motto was ‘As far as the world extends’, an ambition illustrated by the projects undertaken during his seven-year stay. Fortresses, bridges, houses and palaces were built. Mauritsstad became the new capital. The Dutch took control of the trade in African slaves. At his behest, scientists and artists such as Frans Post recorded the new colony’s wonders of nature. They quickly documented the native flora, fauna and inhabitants. The art produced indirectly paid tribute to Johan Maurits.